The Saratoga team was looking for help with new product research & development, that would highlight their commitment to quality while utilizing in house inventory. 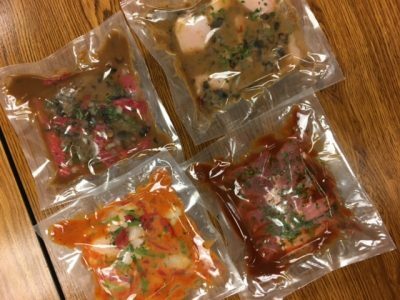 They were looking for a full flavored products that would provide the target consistency and price points for varies food service applications (sauce, glaze, marinade, dressing). The idea was to utilize their current inventory in a unique way that would provide a creative flavorful new ideation. The overall goal was to create new development with the proper texture and flavor attributes. The Saratoga team works regularly with the Chef Services Group in their lab to bring these new concepts to life. The Saratoga Dressing Team is a perfect fit for Chef Services Group; Utilizing their years of manufacturing and product development experience they are able to help produce flavor systems that allow them to have bold on trend flavors within the target cost point. This line of flavorful New Dressings is able to utilize the given inventory with a simple plant procedure and a desired product outcome.